Ok, so I promised a tutorial on Swagbucks for those of you who are wanting to get into it. I use Swagbucks because I save them all year to use for Christmas, but you can use them anytime you’re ready. 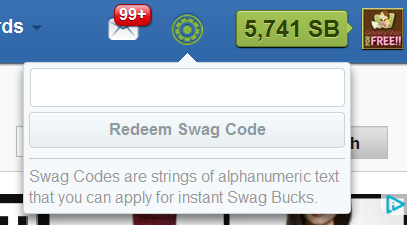 Swagbucks are what you earn when you download and use the Swagbucks search bar. Now the search is powered by Google, so it’s no different except you win Swagbucks for searching. Not every time you search but pretty often, and not just 1 at a time – you can earn alot. I got 7 this morning and it was the third time I searched. Now, I don’t just type stuff in and search to get them, that will get you banned. I use it normally, anytime I go anywhere I search. Like, if you wanted to come here, you could search Grocery Shop For FREE instead of typing it in and then you have chance of winning Swagbucks! Now, why do you want them? Well, you can use them to purchase all sorts of stuff and Giftcards! That’s why I want them. Alot of people like them because you can purchase Amazon giftcards with them, you can even purchase PayPal money with them! You can get Barnes & Noble, Target, Starbucks all kinds and they also have electronics and other things you can get, too! There are times when there is a code hidden somewhere and if you find it you can enter it on the Swagbucks page on the right site where it says “Gimme”. Now, they say the codes aren’t secret anymore! YAY! You can share them now with anyone without the fear of losing your account! I try to let y’all know on the Grocery Shop For FREE Facebook page and I Tweet it from @GroceryShopFREE when I find one, too! You can look to see if there’s a code available and a hint as to where it is in the widget on the right side of this page. If you click on SC (Swag Codes) it will tell you a hint as to where to find it if one is available. You can also read the SwagCodes Blog and find codes sometimes in those – you can read those from the widget or on their site. You can earn Swagbucks when other people sign up under your account – it’s FREE for you and them. You can add a blurb to your signature in your emails telling people they can sign up for Swagbucks thru you and when they sign up under you, you get matching Swagbucks up to 1,000 per referral. What that means is if Mary signs up under you and gets 7 Swagbucks when she searches, YOU get 7 Swagbucks, too, up to 1,000! This only applies to the Swagbucks they get from searching not from finding and entering codes. Also, Friday is Mega Swagbucks Day and the Swagbucks are higher in value on Friday and you get them more often, too! What you search doesn’t matter – if someone else got some for searching “Polar Bears”, it doesn’t mean you will. Any Questions? If you know something I missed or forgot to cover, please share it in the comments the more we know the more we can make! Check out some of things I have gotten with my Swag Bucks! !